Woohooo! I cross the finish line at today's Tour of Switzerland well before the pros - my first stage victory! 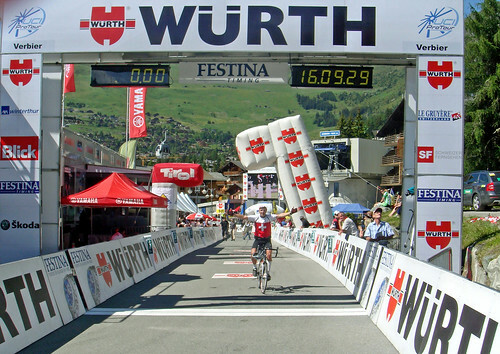 A very fun day watching the tour of Switzerland up at Verbier Ski Station. Katy and I drove and parked near the bottom of the final climb, while Katy’s insane husband Eric rode from Geneva (272 kms round trip). It’s a beautiful, hair-pinned climb up the side of the mountain – great views in every direction. As we approached the top, we were allowed to ride the narrow, fenced in finish through the village. Pretty fun. One of the absolute highlights of the day was the excellent publicity caravan – where they throw out little gifts. Even the power tool sponsor gave us Tour de Suisse caps. The race itself was pretty exciting. 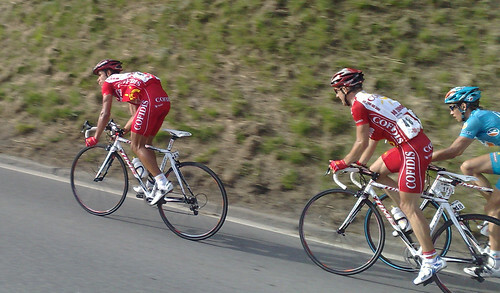 We had been informed that two break away riders were a couple of minutes ahead at the start of the climb, then a minute ahead. Closely followed by some big names – including the ultimate winner Kim Kirchen at the very back of photo. As the huge grupetto approached they were all laughing and chatting. Suddenly, we saw a rider descending(!) at speed and they all started chanting “Anton! Anton” Yep I believe it was Anton the Eusakatel rider – who had already finished. Then as Katy cheered them on and filmed them, a rider yelled “Origato” – Thank-you in Japanese. 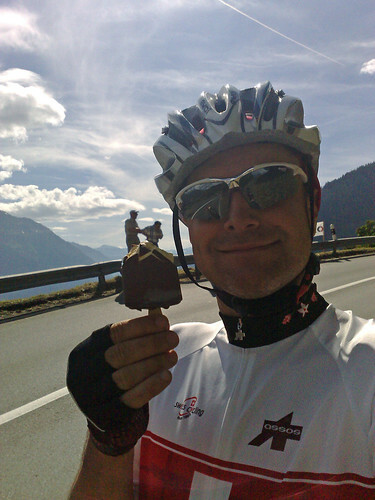 It was the CSC rider – Cancellera? Dekker gets on MY WHEEL! Several teams left their buses at the bottom. 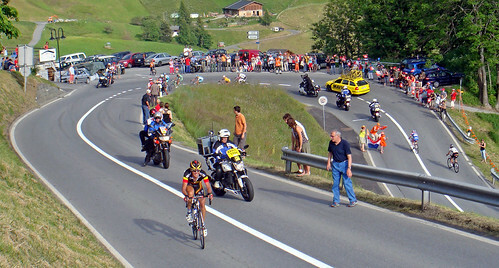 This meant that the road suddenly filled with Pros descending back down. 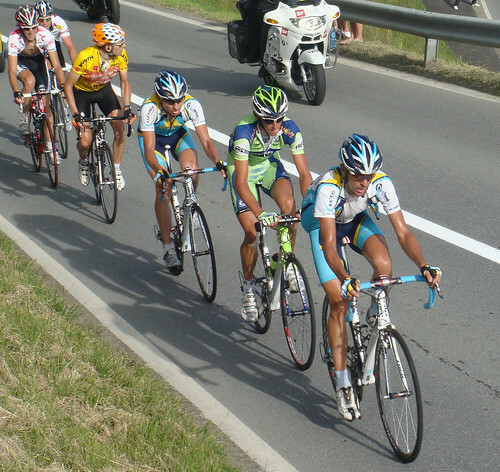 After the broom wagon passed, we joined the descent – and were passed by maybe 30 more pros. Pretty funny. I’d like to say I waved him through and got on his wheel ….. but before I knew it he flew past me. Yahtzee my friend! What a banner day. First, a great photo crossing the finish! Then, freebies like… ice cream… water and lanyard, caps, etc. You got great pictures… and even better… video of Cancellara yelling “Arigato” back to your friend. Then you descend with Dekker. After all this… I can’t wait to see your experiences from le Grand Boucle! Hi Will, Thanks for calling me “insane”. You maybe right though, I may have lost my mind. That may explain why I left weighing 76.5kgs and came back with only 73.8kgs. Only shows that I need to drink more …BEER. Indeed that ice cream bar from the Frisco van was well appreciated. 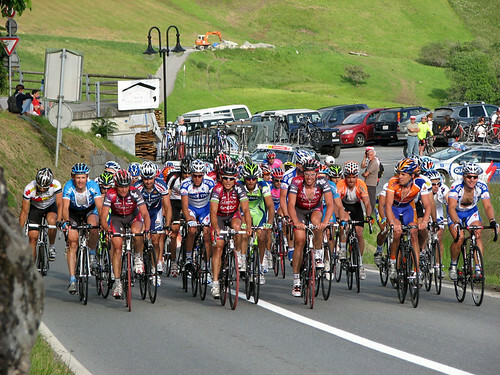 Descending with the pros was priceless! Being thanked (although in wrong language) by next day’s stage winner, Fabian Cancellara was special. You must have being going really fast as the timer hasn’t even started. You have any tips for us fledglings for reaching the upper realms of time warp. What gear ratio did you use ? 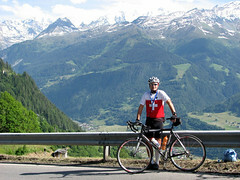 I am going to ride the climb to Verbier from Martigny to watch the Tour de France stage. Will a double chainset do ok 53/39 or should I get a compact 50/34 ? I’d appreciate your opinion having tackled the climb already. Thank you. It really depends how strong you are. In the elevation profile above, Verbier is only a little more than half way (the road continues to col de la couer much higher). So the interesting and steep stuff is above the village and won’t be part of the Tour stage. 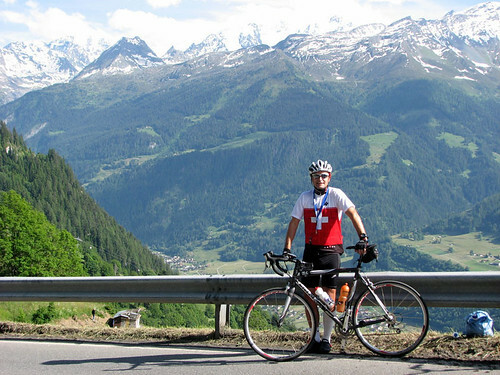 The climb itself isn’t too bad, but if you will be visiting the Alps for lots of climbs then a compact 50×34 is almost essential. Even my VERY strong friends have switched to a compact since moving here. Me? I use a triple with a 30!!!! Personally, I wouldn’t be able to do the climb with a 39, but I am not super strong.